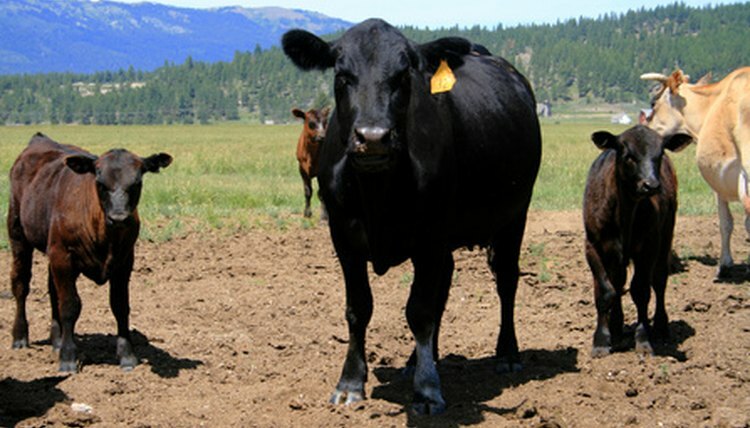 Ruminant animals, such as cattle, are adapted to feed primarily on forage. However, in order to increase milk production and growth rates, large amounts of grain are fed to them. A large increase in a calf’s high carbohydrate grain ration can cause overproduction of lactic acid in the rumen, resulting in acidosis, which is too much acid in the calf’s body. Environmental conditions, such as mud, heat and storms, can force cattle to eat greater amounts of grain during the night, instead of proportionate amounts throughout the day. Additionally, feedlot design and watering systems can affect the feeding patterns of the herd. Acidosis can be divided into acute and sub-acute acidosis. Extract ruminal fluid with a stomach tube approximately two to four hours after a grain feeding. Test a cross section of calves’ pH with a pH meter or pH indicator paper. If the pH of more than 25 percent of the tested calves is less than 5.5, then the herd is considered to be at high risk for acidosis. Consider that other factors, such as feed management, herd health problems and feed mixtures, should also be considered in the diagnosis. Call your veterinarian immediately if your calf shows signs of acidosis. Fast action may be needed to save your calf from acute acidosis or prevent founder, which is a metabolic and vascular disease that involves the inner sensitive structures of the feet. Mix 500 grams of sodium bicarbonate (baking soda), 850 cc of 12 percent formaldehyde, which kills the multiplying bacteria, 20 grams of magnesium oxide and 40 grams of charcoal, according to Oklahoma State. Place the mixture in a plastic container, and mix well. Add enough water to make two liters of solution. Administer 100 ml per 100 pounds of body weight through a stomach tube. Consult your veterinarian regarding whether additional treatments are necessary. Discard leftover solution after 30 days.